The iconic Sweet Chestnut on the NW corner of the Rock Garden has sustained damage to the canopy over the years. The westerly storm force winds have ripped out large limbs over the decades. This year the crop of spike encrusted cases that hold the chestnuts is looking good. How good will only be determined as autumn progresses and the cases burst open. 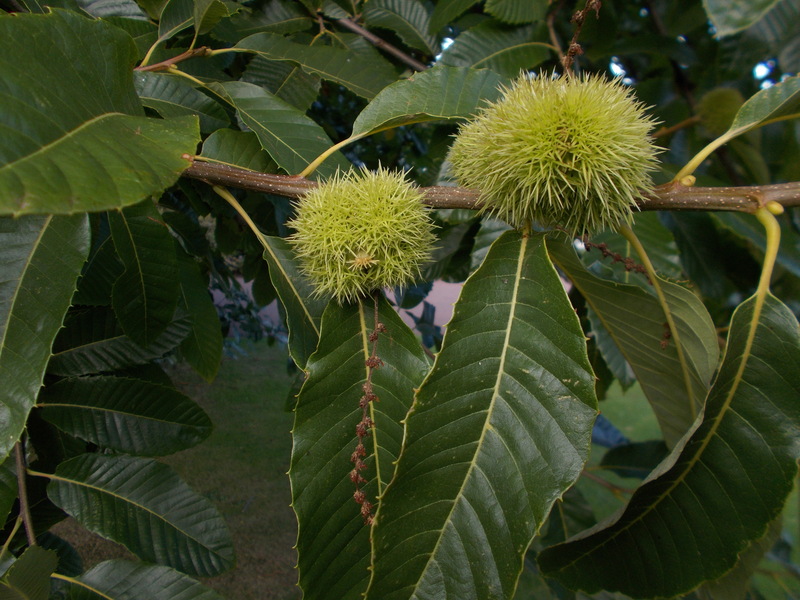 Castanea sativa has a wide geographical spread, Europe, North Africa and SW Asia. Reaching its northernmost limits for the production of edible chestnuts in Scotland. Meteorologists have studied this year’s temperature records and proclaim it equally as hot a summer as 1976. That autumn, as students, we collected and roasted a plentiful supply of chestnuts from this tree. I await the harvest of 2018 with anticipation.